APPIT HAS SOMETHING FOR EVERYONE. workflow-based solutions that span the company’s LOB applications. • Managers have more visibility into bottlenecks and exceptions. 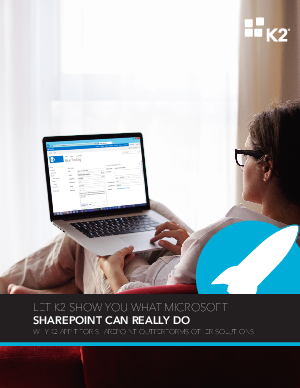 • SharePoint users companywide can do their work from any device thanks to K2’s mobile capabilities. • The company does not have to purchase multiple solutions nor develop custom code. oops! It appears you have an ad blocker enabled. To register, please disable your ad blocker.